Major Dodson is only 13 years old, but already has a rapidly ascending acting career. Television actor best known for playing Corey on FX’s American Horror Story and Sam on AMC’s The Walking Dead. Was born July 12, 2003 at Dallas, Texas, USA. Major Dodson is also known for Alfred Thinks We’re Aliens (2011),and Left Behind (2014), American Horror Story (2011), Revolution (2012). Since The Walking Dead shoots primarily in Georgia, Major does a lot of traveling. Although he attended traditional school when he was younger, it became almost impossible as his fame and acting work load grew. He has been homeschooled for several years now. He was about 6, when he started out in theater on stage as Tiny Tim from A Christmas Carol. He ended up getting an agent after that and started going out and auditioning for commercials and TV/Film roles. 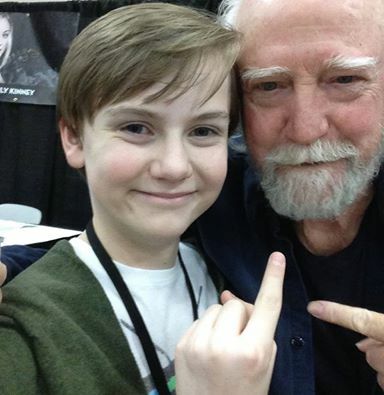 His first day on set The Walking Dead he was welcomed instantly hanging out in the hair and makeup trailer with Josh McDermitt(Josh McDermitt Height and Weight Stats) and Steven Yeun(Steven Yeun Height and Weight Stats). Major spent more time with Melissa McBride(Melissa McBride Height and Weight Stats) and Alexandra Breckenridge(Alexandra Breckenridge Height and Weight Stats) than with the other. He likes to play Minecraft and Pokémon Blue on Original Game Boy. His favorite kind of cookie has to be chocolate chip with miniature M&Ms. Major’s brother is actor Cooper Dodson. He has held television roles since the age of 7. He played Nicolas Cage’s son in the 2014 film Left Behind. His mom helped get him started in acting through submitting him to talent agencies. He organized a charity event called Smiles For The Homeless. He has worked locally in the Houston area to collect necessities for homeless shelters. On The Walking Dead, Alexandra Breckenridge(Alexandra Breckenridge Height and Weight Stats) plays his on-screen mother Jessie Anderson.